Seven seats, a stylish European styled exterior, and amazing fuel efficiency. 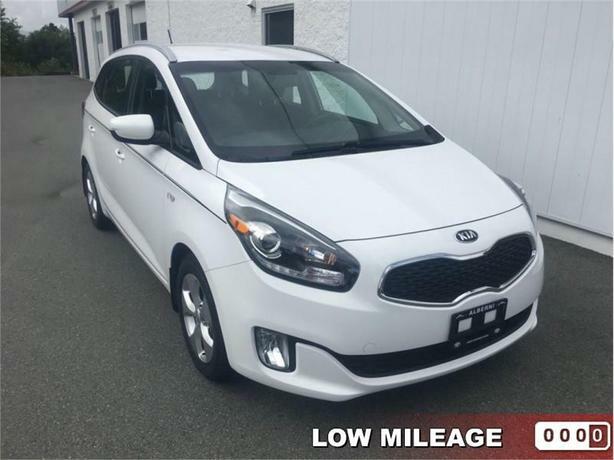 This 2014 Kia Rondo is for sale today in Port Alberni. The 2014 Kia Rondo is a wagon with style and substance from an auto maker that swears up and down that quality is a No. 1 priority.This low mileage wagon has just 41692 kms. It's white in colour and is completely accident free based on the CARFAX Report. It has an automatic transmission and is powered by a 164HP 2.0L 4 Cylinder Engine. This vehicle has been upgraded with the following features: Am / Fm / Cd Player, Sirius Xm Satellite Ready, Air, Tilt, Steering Wheel Controls, Cruise, Power Windows. Our Rondo's trim level is EX. This Kia Rondo EX inspires you with an even more engaging driving experience. It has aluminum alloy wheels, rain-sensing intermittent wipers, roof rack rails, projector beam halogen headlamps with delay-off, UVO audio infotainment system, heated leather steering wheel, dual-zone automatic air conditioning, an auto-dimming rearview mirror, smart device integration, a back-up camera, rear parking sensors, a roll-up cargo cover, leather seat trim, power thigh support, and proximity key for doors and push button start.